Wilfred is finishing his M.A. in Theatre Arts focusing on K-12 Education at San Diego State University where he holds a B.A. in Theatre Performance, Acting and Musical Theatre. 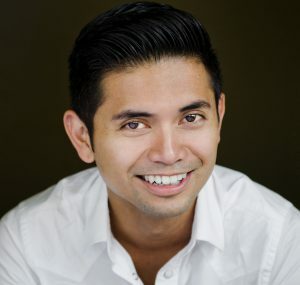 Wilfred trains at MCIT Studio (Meisner and Chekhov Acting technique) and works as a teaching artist with the California Center of the Arts, Playwright’s Project, and as a Director/Choreographer at Young Actor’s Theater. Past: CYT, COSA (guest artist), Chaparral High School, and the Sweetwater Union High School District. Wilfred actively engages in social justice centered work with Blindspot Collective as well as performs on various stages in San Diego. Upcoming performance: New Village Arts Theatre in Carlsbad in Spring of 2019: Smokey Joe’s Café. In 2017, Wilfred was in the original west coast cast of “O Wondrous Night” at SeaWorld San Diego. Other performance credits include Breakthrough Workshop Theatre, Playwright’s Project, Coronado Playhouse, OnStage Playhouse, Patio Playhouse, and university stages at UCSD, SDSU, Southwestern College, and San Diego City College. Listen to him on Spotify and iTunes on the original cast recording of the musical The Things We Never Say featured on the track “Coronado Lights”.